Italian philosopher Antonio Negri has declared that “Every kind of change belongs to a form of community art,” inverting the convention that community art can be an integral component of social change and extending the rubric of art to propose a commons of all those striving to effect change in social, economic, technological and ecological arenas. So how do these endeavors influence and act upon one another? 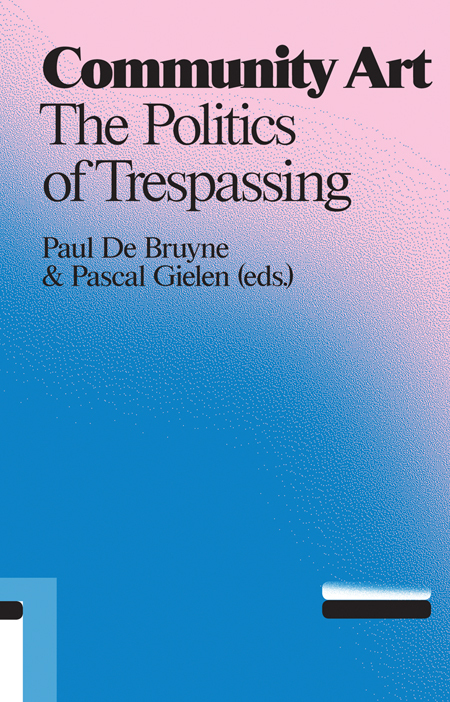 In Community Art, artists and theorists Tilde Björfors, Bertus Borgers, Paul De Bruyne, Changchengh, Luigi Coppola, An De bisschop, Miguel Escobar Varela, Jan Fabre, Alison M. Friedman, Pascal Gielen, Sonja Lavaert, Carol Martin, Antonio Negri, Alida Neslo, Tessa Overbeek, Lionel Popkin, Richard Schechner, Hein Schoer, Ricky Seabra, Jonas Staal, Klaas Tindemans, Luk van den Dries, Quirijn Lennert van den Hoogen, Hans van Maanen, Bart Van Nuffelen and Karel Vanhaesebrouck explore the practices of artistic and social movements in western and non-western societies.